Ciutadella passenger and car ferry ticket prices, timetables, ticket reservations and information for ferries sailing from Ciutadella to Alcudia and Barcellona. Compare all available Ciutadella ferry ticket prices in real time and book the cheapest available Ciutadella car and passenger ferry tickets sailing to and from Ciutadella, Alcudia and Barcellona with Balearia Ferry Lines ferries online with instant confirmation. 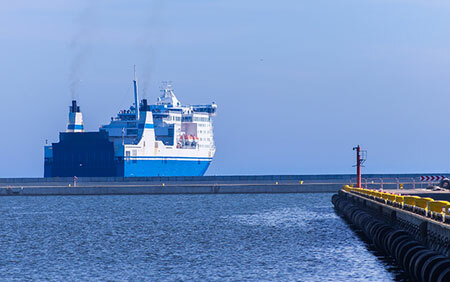 Book Ciutadella Ferry Tickets with Balearia Ferry Lines for ferries sailing from Ciutadella to Alcudia and Barcellona online in advance to enjoy the cheapest available ferry ticket price. The price you see is the price you pay. There are no hidden extras or surprises such as added fuel surcharges or booking fees and we do not charge you anything extra for paying with a Visa Electron card. The price we quote you for your selected Ciutadella passenger or car ferry ticket, onboard accommodation and vehicle type is all you will pay, and that's a promise. To obtain a Ciutadella ferry ticket price and book your ferry ticket securely online please use the real time ferry booking form on the left. You are also able to add a hotel at your destination, or anywhere else, to your ferry ticket when completing your ferry ticket reservation. Situated on the west coast of the island, Ciutadella is a stylish place to visit that is well known for sumptuous fish restaurants serving the local catch of the day. Although the City of Ciutadella is the former commercial and cultural centre of Menorca, the depth of history, culture and nightlife here often takes visitors by surprise. For those visitors to Menorca who have never ventured beyond the resort of Son Bou a visit to Ciutadella on the extreme west coast of the island will be a real eye opener, and will hopefully demonstrate that there is more to the island than lazy days spent of the beach. The old district has to be visited for it small street, places (Palacio del Conde de Torresaura, Palacio Salort, Palacio Vivo, Palacio Olives). The little port of Ciutadella is a high touristic places with it pier with restaurants. Ciutadella Menorca - Nicknamed Vella I Bella (“The Old and the Beautiful”), was originally founded by the Carthaginians. Always in competition with Mahón, Ciutadella was the capital of Menorca (Minorca) during the Moorish occupation and was at that time known as Medina Minurqua. After being recaptured by the Christian forces of Alfonso II it was annexed to the Crown of Aragon and became an important Mediterranean trading centre with a busy port. The most notable date in the history of Ciutadella is 9th July 1558, for it was on this day that the city was invaded by a large Turkish army under the notorious Barbarossa. An Armada of 140 ships, carrying some 15,000 well prepared troops, attacked the port and besieged the town for 8 days. Defended by only a handful of men, Cituadella soon fell and was almost totally destroyed by the invading forces. All of Ciutadella’s surviving inhabitants (over 3,000) were taken to Turkey and sold into slavery in Istanbul. The only building of note which survived this devastation was the 13th century cathedral, much of the remainder was not rebuilt until the 17th century. Most people will enter Ciutadella for the first time by road, driving past the new statue, on the roundabout on the new city bypass. It is a magnificent statue of a rearing stallion and symbolises the famous Ciutadella fiesta "Fiesta de San Juan". Usually celebrated at the end of June, not to be missed if you're lucky enough to be here when it is on. The harbour, a narrow inlet, is one of the smallest ports in the Mediterranean. Here, sitting in good company at one of the harbourside cafés, you can experience, to me, what Menorca is all about. Relaxed and bathed in sunshine, watching the boats bob up and down and the people strolling by - the worries of the world vanish. One of the best places to view the harbour is from the main square, Plaza de's Born. The centre of the square is dominated by an obelisk which commemorates the defence of the city in 1558 when it was attacked by the Moors. On one side of the square is the Town hall across from this is Palace Torre Saura. Open to the public and to the side of this is an alley, which leads up into the old city. Most of the streets are narrow and typically Mediterranean. The arches of Ses Voltes provide welcome shade from the sun while shopping along the main street. Ciutadella remained the island’s capital until the arrival of the British in 1708, but even after this continued as the religious capital of Menorca, due to the refusal of the Bishop to move. Ciutadella today is an attractive city with a population of around 28,000, it has a picturesque port and a charming old quarter, which is a pleasure to explore. Although little remains from the Arab occupation (courtesy of the Turks), Ciutadella still has plenty to offer in the way of architecture, boasting several splendid Baroque and Gothic churches and some opulent palaces, dating from the restoration of the city during the 17th and 18th centuries. The main square - the Plaça d’es Born, a former Arab parade ground, is lined with impressive buildings and is one of the most attractive squares in Spain. In the centre of the square stands an obelisk in memory of the Turkish invasion, other buildings of interest include the Town Hall, the Palau de Torresaura, the Palau Salort and the Teatre Municipal d’es Born. The Gothic cathedral in the Plaça de la Catedral was started in the 13th century on the former site of an Arab mosque, it survived the ravages of the Turks in 1558, but ironically suffered more damage during the Spanish Civil War (1936-39), when most of its furnishings were destroyed, the Neo-Classic front entrance dates from the 19th century. There are a number of other pretty squares around the city, among them the Plaça Libertat, located close to an Augustine monastery, its covered markets alive with locals shopping for fresh produce, the Plaça Nova, full of lively cafés and bars, the Plaça d’es Esplanada and Plaça dels Pins, two green squares perfect for al fresco dining, and the Plaça Alfons III which marks the spot where the road from Mahón reached the old city gates. The attractive port, situated on a long curving inlet, is lined with traditional fishing boats on one side and yachts and pleasure craft on the other, visit in the morning and you will see the fishermen arriving with the days catch, fresh and ready to supply the waterside restaurants. Ciutadella harbour is somewhat shallow, hence the British preference for Mahón, it is still a busy port and has a ferry link with Alcudia in neighbouring Mallorca. Some of the only remains of the Arab occupation can be seen along the Ses Voltes, a walkway which runs from the cathedral to the Plaça Nova, amongst the vaulted Moorish archways you will find some excellent little souvenir shops, where you can buy mementos of your visit to the beautiful Ciutadella. To the north-west of Ciutadella you will find a purpose built holiday development called Los Delfines, which takes in the resorts of Cala n Forcat and Cala n Blanes, in an area of rocky inlets and small coves, the best beach in this area is at Cala n Blanes. To the south you will find the resorts of Cala Blanca and Cala Santandria together with the small village of Son Cabrisses. Best Price Guarantee - We always offer you our lowest available Balearia Ferry Lines passenger and car ferries ticket price to and from Ciutadella. There are no hidden extras or surprises such as added fuel surcharges or booking fees and we also we do not charge you anything extra for paying with a Visa Electron card. The price we quote for your selected Ciutadella ferry ticket, onboard accommodation and vehicle type is all you will pay, and that's a promise! In the unlikely event you find the same all inclusive Ciutadella ferry ticket cheaper in the brochure of any other tour operator we promise that we will do our best to beat that price or offer you the choice of requesting a refund. To book Ciutadella car and passenger ferry tickets please click here. At ferryto.co.uk you are able to obtain live Ciutadella ferry ticket prices, check availability and book car and passenger ferry tickets to and from Ciutadella at our lowest available ticket price. Ferryto.co.uk is part of the world's largest online ferry ticket distribution network providing the ability to book over 80 major European ferry operators including to Ciutadella and to over 1,200 other ferry routes throughout the UK, France, Spain, Ireland, Holland, Eastern Europe, the Mediterranean, the Baltic and North Africa.